These dueling eyesores are within two blocks of each other on Hawthorne Blvd. east of the Los Angeles International Airport. 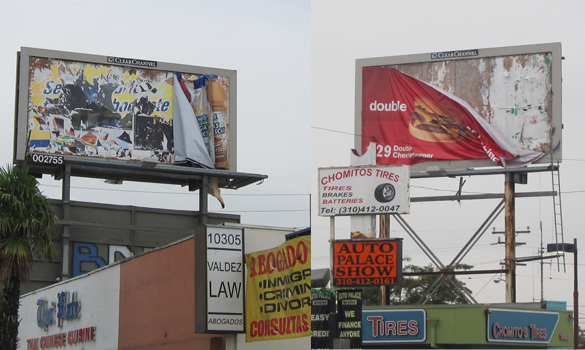 It’s hard to see what the billboard on the left is–or was–advertising, but the sign on the right is clearly promoting McDonald’s double cheeseburgers. One might think that Clear Channel, the world’s largest owner of billboards, would pay attention to signs promoting McDonald’s, the world’s largest hamburger chain and the biggest outdoor advertiser in the U.S. On the other hand, maybe the old, dripping ad copy is just an attention-getting device.